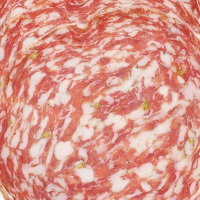 Mortadella, bologna, or semi dry sausage is a type of sausage that contains less than 55 percent water content. With 339 calories per 100g serving size it can't be called low calories. Overeating semi-dry sauce may promote unwanted weight gains. The calories in Semi-Dry Sausage per 200g(1pack) is 678 calories. Semi-Dry Sausage is calculated to be 339Cal per 100 grams making 80Cal equivalent to 23.6g with 59.4g of mostly fat、30.8g of protein、5.2g of carbohydrates in 200g while being rich in vitamins and minerals such as Niacin and Vitamin B12.